A couple of Fridays ago, I found myself wandering aimlessly around the city of London like a lost soul. I had finished work early and was going out later in the evening. I had booked a table at an underground supper club in East Sheen you see. For four people, Mr and Mrs Food Urchin along with Essex Eating Dan and his girlfriend. I had about two hours to kill and I knew I had to steer clear of pubs. I also had to find an internet cafe to get address details for the venue from my email. Yet looking for one was like looking for the holy grail. There was once a time when you couldn't move for dodgy, badly lit units on the high street that had hastily been fitted out with banks of computers and partitioning, charging ten pounds a minute. It seems that these days though, they have all but disappeared. However I couldn't let the guys down, especially Dan and his good lady who hadn't experienced guerrilla dining before so I persevered and finally tracked down a ramshackle mobile phone shop on Whitechapel High Street, which had a couple of monitors linked up and for hire. Yes, bloody Whitechapel, which from where I work in Barbican is like 50 miles or something. Still I went in, logged on and diligently tapped in the address into my Nokia and went onto meet everyone at our designated meeting point on time, even managing to get a sneaky pint on the way. Getting there was pretty easy, a 20 minute train journey from Waterloo and it was nice to sit and chat having left the scrum on the underground behind. I must admit though that all that walking had left me a little weary and unable to concentrate fully on Dan's exploits from the previous night. Apparently he had been to a launch for a new pop-up book, very popular by all accounts, something to do with David Hasselhoff and a pig trotter? I don't know I wasn't really listening but it sounded like fun. Once at our destination we found The Pig and Whistle, a proper locals pub and had a refresher which perked me up no end and then quickly made our way to ensure we made the 7:30 opening promptly. Leading ahead (I had the details remember) I marched down the road with the others running after me and after negotiating a sharp left, soon found the secret place. I knocked on the door and waited. There was no sign of life so I knocked again. After a pause, a small shuffling from way beyond the door took place and a light came on. Eventually the door opened and an old lady peered out. "Who is it? What do you want?" she asked leaving me somewhat confused. Confused because I felt that she should be expecting us and welcoming us in with open arms. Not only that but I've met Lara, the cook and proprietor of Sheen Suppers before for a WMPC exchange. "Bloody hell, she's aged" I thought. Of course, it soon became apparent that I had been knocking on the wrong door. The house we wanted was in fact two doors down. Not only had I fudged the address after all that effort but I also succeeded in terrorising a pensioner. With the others behind me, uneasily shuffling their feet, I must admit the phrase "you plonker Rodney" did spring to mind. Luckily a couple turned up in cab and it was obvious where they were going, so our party followed them. Feeling slightly embarrassed, I apologised, bowed slightly and then scurried back down the street into the correct house where this time I was warmly greeted in the hallway by a friendly chap called Iain. Lara also popped out of the kitchen to say hello and have a quick chat. Despite the fact that she had 16 covers, looked quite cool, calm and collected and not very old at all. If I ever have a go at this secret dining malarky (and I have thought about it) should I be cooking for as many people, expect to see me in my pants, dripping in sweat, with blood, tears and booze running down my face as I crawl out of the kitchen to stand and greet you. Without further ado, Iain ushered us into a charming living room, softly lit with candlelight with jazz music playing in the background and sat us at our table. Slowly but surely other diners entered and as I surveyed our surroundings, a chord struck inside that the whole set up did seem, well quite romantic really. Making me wonder to myself whether I should have invited the others along after all and just kept it as a twosome. I mean, this would have been the perfect opportunity to woo Dan. But then again do we really want a sequel to Bumcrack Fountain? And besides there is only one Essex cowboy out there who is flirting with homoeroticism these days and his name is Jamie Oliver. These were just a few of the random thoughts that entered my mind as I perused the menu, which looked very enticing indeed. Iain was soon back on the scene with some olives and a tasting of the chardonnay that he had matched with the first course. He obviously knew quite a bit about wine but was far from stuffy, delivering little tidbits of information about the wine and the food throughout the evening with a great sense of humour. He also didn't bat an eyelid at the fact that we had also brought two bottles of our own, bringing us a bucket with ice to keep the Chapel Down cool. All in all the atmosphere was very convivial and relaxed. 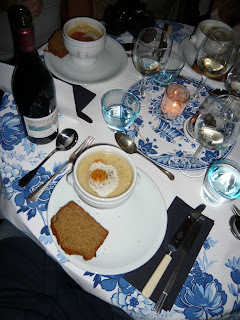 After a short period of chatting amongst ourselves, the starter came out which was a Celeriac and Potato Soup with Smoked Salmon, Fried Quails Egg and Soda Bread. It looked and smelt pretty impressive but first things first, there had to be the obligatory snapping away with our cameras. Of course, due to the low light levels and the fact that I don't really know how to use my Lumix, my initial shots consisted of bleached out tablecloth and little else. As a consequence I decided to use the tactic of raising the camera aloft in the air above my head as far as I could stretch and take aerial pictures of the table instead. So apologies for the poor quality of the photos! Anyway back to the soup, which was delicious. The combination of creamy root vegetable base with the salmon and the egg worked really well and the soda bread was extremely fresh and moorish. And the wine, namely "Pulenta Estate Chardonnay, Mendoza, 2007" gave fine compliment to the dish with a slight buttery flavour. Having wolfed my soup down in a matter of seconds, I made a mental note to myself to take it easy with the main course as I didn't want my fellow dining companions to think that I was greedy so and so. 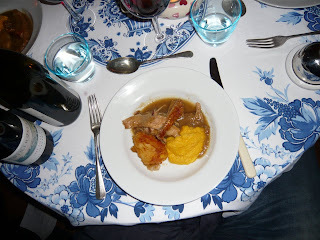 But unfortunately, next up was Braised Belly of Pork with Crackling with Black Pudding Faggots, Roast Potato and Autumn Root Vegetable Puree and so any thought of self restraint was thrown out of the window. I love pork belly you see and if you confessed that to me that you don't like this cut then I would simply say you were an idiot, kick you up the arse and send you on your way. So Lara was onto an immediate winner with this and her simple braising approach hit all the right buttons. Soft, tender, melt in the mouth stuff with some fine crackling. Scoffed in seconds. Plus the potato was crunchy on the outside, fluffy on the inside and the puree delivered a lovely sweetness combined with cumin spice. Alas there was one component missing from the plate which was the black pudding faggots. Iain had confessed that there had been a "masterchef moment" in the kitchen and that the faggots were deemed not good enough to be served up. Which is fair play. Although I was really really really really looking forward to them, Lara proved that she was commited to executing her dishes to a high standard and wasn't going to be letting any old crap hit the table. The wine, this time was Te Mania, Nelson Pinot Noir 2008. Again, very quaffable, fruity and heavy with berries. The cheese course consisted of a smoked wensleydale, stilton and a goat's cheese delivered to us by so far, an unsung hero of the evening who was Kim who had been helping in the kitchen (aha so you weren't all alone in there where you Lara). 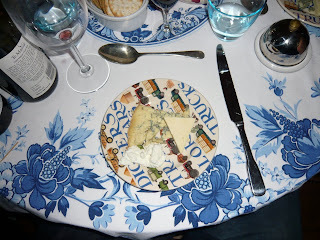 All three fromages were very good with the goat being the favourite and were washed down with some fine Taylors LBV port. By this point I suspect that early signs of rosacea were starting to show on my face as we had also been nipping at the bottles of booze that we'd brought with us. But luckily it was dark and everyone else in the room were now starting to raise the noise levels so I didn't attract too much attention to the fact that I was fairly fish-paste by this point. For dessert, we finished up with a gorgeous Banana Caramel Pudding with Chocolate and Rum Sauce, Cream and a Banana Wafer. 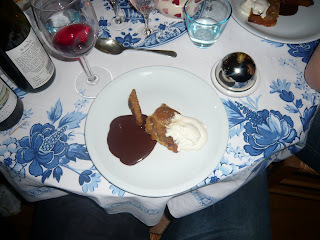 On paper, it did read as quite a sickly sweet ending to the evening but all the ingredients were nicely balanced and rounded up the proceedings beautifully. It's funny, I wouldn't say that each plate came loaded with food but still I ended up feeling absolutely stuffed by the end of the night barely having room to drink my coffee. Testimony again to Lara's cooking concerning portion control and getting the food out of the kitchen, timing wise. So hats off to her, along with Iain and Kim, they all did a great job. Right at the end of the evening, I wondered into the kitchen which looked like the proverbial bomb had hit it, for a bit of post match analysis and it was funny to hear about the scenes that belied the calm exterior. The extreme profanity, the burnt faggots, the Transvision Vamp soundtrack that kept everything pumping along and the six pints of Old Whallop that Iain had consumed before the guests arrived for the evening. But what impressed me most was that fact that Lara and co were simply focused on providing a reasonable, understated yet alternative dining experience with an eye on quality. No bells or whistles needed here, just good food and great hospitality. At £25 a head for four courses with matched wine, I can't recommend it highly enough. And going out with Dan and his missus wasn't that bad either, although I might just suggest that just the two of us go next time. What a great evening eh Dan?...But now more than slightly terrified by your (until this point, unspoken) thought process when we first arrived, I thought you were looking at me a tad strangely. Also loving your photos from Space orbit, I think I can make out the Great Wall of China in one of them. 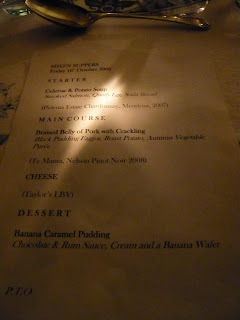 Seriously, very entertaining write up mate and well done to Lara, Iain and Kim at Sheen Suppers, I salute you. Wow, that's really excellent value with the inclusion of matched wine! Might have to get arse in gear and book as I've been meaning to visit more underground restaus since Ms Marmite Lover's and haven't! 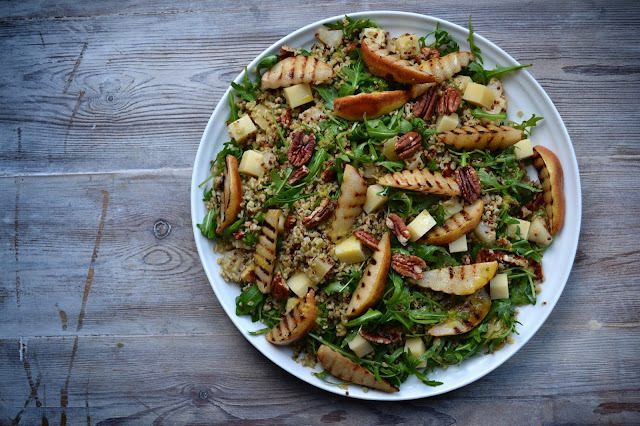 Between your account and Dan's, it sounds like this pop-up resto is well worth the trek out. I do like the idea of the wine-matching, too. A bold move on their part, but seems like it more than paid off. Sounds like you had quite an evening. So that's why you sent me that random text about coming round and using our internet! It all makes sense now!!! Lara does lovely food. But what fascinated me was your food shots, they practically included your groin. Exciting experience was it? haha - that poor lady! This sounds great, well worth the journey.